On May 11, 2011, a five-Judge Constitution Bench of the Supreme Court had given ruling on the curative petition filed by the CBI against the Court’s judgment in Keshub Mahindra v. State of Madhya Pradesh on 13 September 1996. The CBI’s plea was that in 1996, the Court had erroneously ignored material which would have made, prima facie, an offence chargeable under section 304 (Part II) IPC. But in 1996, the Court had quashed the charge under section 304 (Part II). Under section 304 (Part II) IPC, whoever commits culpable homicide not amounting to murder, shall be punished with imprisonment of either description for a term which may extend to 10 years, or with fine, or with both, if the act is done with the knowledge that it is likely to cause death, but without any intention to cause death, or to cause such bodily injury as is likely to cause death. The accused in the Bhopal disaster criminal case were ultimately charged with section 304-A IPC, which deals with causing death by negligence, which could only result in maximum imprisonment for two years or with fine or with both. CBI’s argument in that case was that the judgment dated 13.9.1996 resulted in perpetuation of irremediable injustice necessitating filing of the curative petitions seeking recall of the judgment dated 13.9.1996. The CBI submitted that because of the Supreme Court’s judgment, the Magistrate was barred from eexecising the judicial power under section 323 of the CrPC, even though the Code vested the jurisdiction in him to alter the charge or commit the case to the Court of sessions as the case may be, on the basis of evidence that came on record during the trial. In its judgment dismissing the curative petition, the Supreme Court held that no decision by any court, this Court not excluded, can be read in a manner as to nullify the express provisions of an Act or the Code, and the 1996 judgment never intended to do so. All that the Court had done in 1996 was to base its findings on materials gathered in investigation and brought before the Court till that stage, it said. Therefore, the Court disagreed with the view that the 1996 judgment was a fetter against the proper exercise of powers by a court of competent jurisdiction under the relevant provisions of the Code. The Court had specifically asserted that there was no ground falling within the parameters of Rupa Ashok Hurra v. Ashok Hurra (2002 (4) SCC 388) was made out in the curative petitions. The Court also did not find satisfactory explanation to file such curative petitions after about 14 years from the 1996 judgment. The Naz curative petition, referred to the Constitution Bench on 2 February, is the most significant curative petition to be heard in the open court, after the last one filed by CBI against the 1996 judgment in Bhopal case. Therefore, it is important to know whether the Naz curative petition does not suffer from the same flaws which led to the dismissal of the CBI curative petition in 2011. First and foremost, the Naz curative petition has been filed in time in 2014, after the dismissal of the review petition by the Court in January 2014. The Supreme Court’s Division Bench comprising justices GS Singhvi and SJ Mukhopadhaya reversed the 2009 Delhi high court judgment decriminalizing consensual sexual acts of adults in private on 11 December 2013. On 22 April 2014, a four-Judge bench directed the registry to list the curative petition for hearing in the open court the following week. Strangely, this did not happen, and the petitioners too were not keen on pressing it, obviously for strategic reasons. Justice Singhvi retired on 12 December, 2013 and Justice Mukhopadhaya retired on 14 March 2015. The Supreme Court rules require that if the Judges who delivered the main judgment had not retired, they would also sit along with the first three senior-most Judges to hear the curative petition in their chambers. Justice Mukhopadhaya was part of the bench which heard the petition in circulation in the chambers on 22 April 2014. But that did not come in the way of direction to list it for hearing in the open court. But the inexplicable question is why it took nearly two years to be listed until on 2 February 2016. Probably, the former CJI, HL Dattu did not want to hear it during his tenure, and therefore, passed the buck. Meanwhile, Justice Mukhopadhaya, one of the authors of the 11 December 2013 judgment , also retired. The curative petitioners thus had no reason to worry. Unlike the review petitions, the Naz curative petition before the Court claims that there is a larger, gross miscarriage of justice that must be corrected. The curative plea filed by the CBI in 2010 in the Bhopal disaster case probably did not make similar convincing claim. The composition of the Constitution bench to hear the Naz curative petition will be of interest. In 2011, Chief Justice SH Kapadia presided over the Bhopal curative bench, comprising himself, and justices Altamas Kabir, RV Raveendran, B Sudershan Reddy and Aftab Alam. Although the first three senior most Judges of the Court are likely to be part of the bench in terms of the Supreme Court Rules, one can speculate that the fourth and fifth senior-most Judges will also become the part of the Constitution Bench. In other words, all the five members of the Supreme Court Collegium will form part of the Constitution Bench to hear the Naz curative. Thus apart from the CJI, and justices Anil R Dave, and JS Khehar, justices Dipak Misra and J Chelameswar are likely to be part of the Constitution bench to hear the curative petition. The Hindu has reported today that the CJI has assured senior advocate Anand Grover, appearing for petitioner, Naz Foundation, that the new bench may not limit itself to the narrow confines of the curative law, but opt for a comprehensive hearing of the arguments placed for the protection of the dignity and rights of the LGBT community. This has given hopes to the LGBT activists that justice will be done. At last. In the Bhopal disaster case, the 1996 judgment was delivered by a two-Judge Bench. 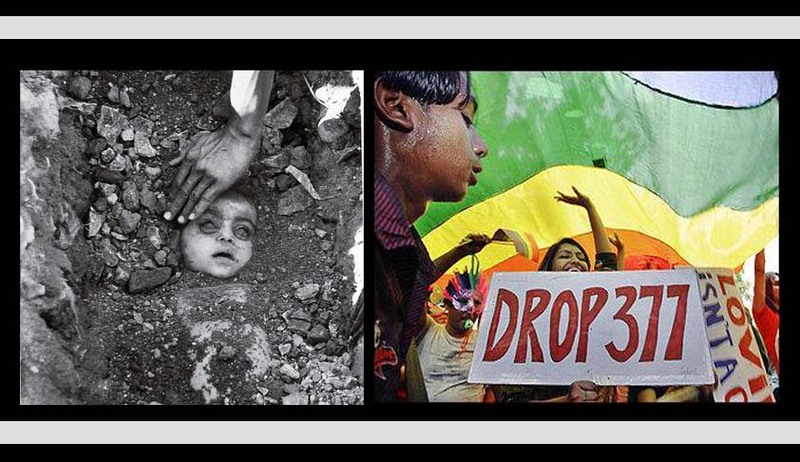 The Bhopal curative petition was first heard by a three-Judge bench in circulation in their chambers, on 31 August 2010, which directed that it be listed, after service was complete. The bench which delivered the 11 May 2011 judgment included justices B.Sudarshan Reddy and Aftab Alam. Their order of seniority at that time could have been four and five, given the fact that the first three at that time were the three senior-most. However, Livelaw would stand corrected if the facts are otherwise. The Naz curative petition was first heard by a four-Judge bench on 22 April 2014. The bench directed its listing in the following week.